Never too late, as far as I'm concerned, to vote in the poll predicting Fernando Martinez's uniform number. Although the watch was a false alarm last year, with martinez destroying it in AAA Buffalo and Ryan Church the latest Met to be suffering injury (the NY Daily News reports a trip to the disabled list is under consideration, especially while Carlos Beltran nurses a sore knee) it's possible we could see "Fartinez" as soon as this evening. Martinez is wearing No. 3 in Buffalo (Alex Cora occupies it here) and had 67 in spring training. The poll -- pretty much neglected for months -- showed some support for No. 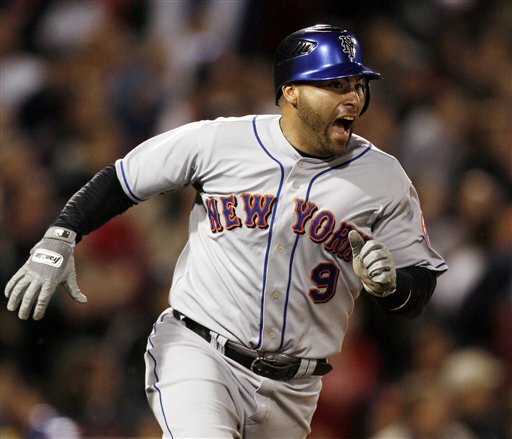 8 perhaps as a backlash for the Mets seeming reluctance to re-issue since Gary Carter's election to the Hall of Fame along with Carter's gauche politicking for the managing job. Hey, how about that Omir Santos? Keith Olbermann appears to have received our information on near-Met Wilbur Huckle. 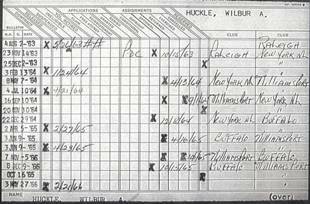 In his latest post, Keith quotes the article we posted and reveals that the roster obtained by his photographer friend includes Huckle's name written in pencil and identified as wearing No. 24 -- a jersey that would have been available in September of 1963. He also follows up with details of the New Breed's push for Huckle's presidential candidacy in 1964. A shout-out for MBTN and Jason? Nope. Reader Edward in the meantime reminds us that Darryl Strawberry and a pitcher -- he cannot recall who -- were similarly invited to spend time with the 1982 Mets at season's end. Keith's blog has been added to the "Good at Baseball" links to the left. To the Mets links, I've added those of beat writers Adam Rubin of the Daily News and David Lennon of Newsday -- two guys who work incredibly hard so that other bloggers have links to aggregate every day. The print press is getting killed and the Internet is a great thing but to me there's nothing like getting my hands all inky with the Snooze every morning. At 50 cents a day it's an ideal commute killer and a bargain too. Read the papers. The Mets appear to have shut down their online survey on their uniforms -- hopefully not before you, like me, submitted a few dozen responses. Don't think I've come across anyone who's a big fan of the black anymore but I sense the hatred among the prototypes in the survey was strongest for the vest which, I'm just gonna say, I don't think is so bad provided you're resigned to the inevitability of an alternate, which I am. But you know what I really hate and they didn't even ask about? Those two-tone helmets. My, they're awful. Anyway, I'd give a week's pay to be the guy to summarize the survey findings for Jeff. We weren't even finished with the press events around the Mets by the Numbers book last spring when my co-writer Matt Silverman was at work on two new projects. One was Cubs by the Numbers (I know, right?) done with the same editor at Skyhorse and with Kasey Ignarski who'd been tracking Cubs numbers for at least as long as I'd been doing Mets numbers here (also Al Yellon, at the Bleed Cubbie Blue blog). If you happen to have a friend who's a Cubs fan, consider buying them this as a gift. The other project was a daring diary style book with none other than Keith Hernandez which Matthew was doing via phone interviews and transcribed notes all summer long, never knowing how the narrative would turn out. It became Shea Goodbye, recently published by Triumph. I've added Ramon Martinez to the list of Mets who've worn three numbers as published on the Jeff McKnight page. Now can we get rid of the guy already? I didn't notice this until his last turn at bat, but Ramon Martinez yesterday was wearing No. 6, and not the No. 26 he wore in his hasty '09 debut on Monday. I remember thinking that the 26 jersey looked baggy on him, so that may be one reason, but interesting all the same since it's yet another issuance of No. 6 -- the most frequently dealt in Mets history now with 38 different players. I'm convinced No. 6 is one of those jerseys they carry around on the road for just this situation. I immediately went to write this up on the site when I saw it -- noting then that a few visitors had already pointed it out -- when Martinez hit into a double play that ruined my mood and made me want to murder Jerry Manuel for having not pulled one of those sudden late-inning pinch-hit calls he's becoming famous for screwing up. Really, Jerry. And batting him sixth? Anyhow, that now makes three numbers already for Martinez (22, 26 and 6). I can't remember off-hand which was the last Met to switch numbers in his second game (and the database is a few jigowatts short of querying for that fact) but it's happened before several times. Tom Hall in 1975 in debuted in 42 and had 19 the next night. Watching the Met debut of Tim Redding, who tonight will become the 860th Met of all-time. Redding will be suited up in No. 44 -- which belonged to four different guys last year, none of whom I could have told you had I not just looked it up myself, I don't think. If you're interested in making a guess in the comments section, go ahead, I won't say who they are. Redding's accompanying lineup is a little goofy -- a continuation of the stuff we saw last night where Fernando Tatis played short and Jerry Manuel, once again, made a baffling pinch-hitting call that blew up his face with the game on the line. Yet, Angel Pagan starts tonight in left while Daniel Murphy and Ryan "Doghouse" Church once again sit. Seems like only a moment ago I was praising the flexibility of this roster but this is about as stretched out as I'd like to go right now. Carlos Delgado, you may have heard, is on his way to the operating room and I can't imagine he reappears until August or so. Redding's recall, by the way, meant another demotion for Nelson Figueroa -- who came and went without an appearance -- and a continuing tour for Ken Takahashi. Don't look now but the Mets are finally getting around to considering changes to their uniforms. And not all good ones, it looks like. Some friends at the Crane Pool Forum passed along this online survey that I encourage you to take. The Mets appear to be toying with the idea of dropping black (probably eight years too late, but they've never been too quick on the uptake) and seem to want opinions on keeping or removing the trim around the buttons and collars (I find myself divided depending on the look) and on white vs. off-white. They also look fairly determined to introduce a radical "alternate" next season, perhaps a version of the vest above, or, please God, no, the nauseating armpit-racing-stripe overdesign below. I'm an admirer of the Mets traditional look but not as hostile as some to changing it up now and again.And I'd certainly prefer to see them mix in the tradional orange-and-blue into any design they come up with, so if they're going to go with something new next year, give me Vest A, I guess. They've also been kind enough to ask, in so many words, how offensive you find the appalling lack of Met character at the new ballpark. There's a space for comments, please remark upon the astonishing lack of a Mets Hall of Fame there and encourage them to build one and then name me the curator. What are your opinions? I'm especially interested to hear your thoughts on the theoretical alternates. This team already has that quality of looking terrific when it wins and ghastly when it loses, which I guess is a good sign because it indicates an expectation of victory accompanies us most nights, and so managing my own moods as they proceed through a long season is going to be challenging at times. What I like about this team however has been on display this weekend in San Francisco, where a guy who replaced Marlon Anderson on the bench can sub in, legitimately, at cleanup, while the choice of which guy to back up at first base or at short in a pinch isn't an automatic crippling. And where a rookie can go from capably filling in for Sean Green to capably replacing JJ Putz on consecutive nights. They're still a little too sloppy for my liking but what's not to like about beating up on Tim Lincecum, Randy Johnson and Brian Wilson: No slouches there. As you probably noticed they've done it without Carlos Delgado who's going to be out for a long stretch, probably. They finally got around to disabling him today only to call the forgotten man, Angel Pagan, who last played for the Mets more than a year ago, and on Saturday was still wearing No. 16. Nothing like making dumb play after dumb play and damn near getting swept at home by the Braves to take all the good feelings out of a seven-game win streak; then again there's Carlos Delgado's hip, Jose Reyes' hopelessly casual attitude, the fact that JJ Putz can't finish an inning in under 15 minutes, Jerry Manuel's continued baffling moves, and perhaps the season's toughest road trip ahead of us, so don't feel too bad yet. The flight to san Francisco tonight -- a long one, and they deserve it -- won't include Jon Niese, whose been optioned back to Buffalo after a subpar outing in his second turn as Oliver Perez's stand-in. His seat goes instead to Nelson Figueroa, who never made good on his threat to leave but may stick around for some time considering the sudden back-of-the-bullpen struggles of Ken Takahashi. Niese's next start, it would seem, would go to Tim Redding as long as his Buffalo tune-ups continue progressing. 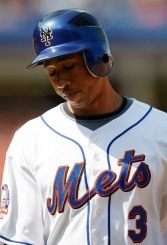 Delgado in the meantime appears headed to the disabled list, the Mets having compromised their bench for the requisite number of games without even a diagnosis of what's actually bothering him. Speculation of a replacement is even harder to figure at this point, with Nick Evans batting 083 and the rest of the Buffalo lineup barely any better. Stop beating on Oliver Perez, everybody. He's pitched terribly this year, for sure, but the next guy who smugly explains away his struggles to a "10-cent head" is gonna get it. For one thing, most jocks are thick, and being a little slow out there is a virtue sometimes, if you insist on a literal interpretation of the remark. But I think there's more to it than that. A physical injury, particularly a non-deblilitating but bothersome one such as tendonitis, is a perfectly reasonable explanation (not to mention consistent with Dan Warthen's complaint that Perez showed up out of shape this year) if only Ollie were offered the same benefit of the doubt as, for example, a teammate who also appears to struggle with control and confidence and makes problems for the bullpen by failing to last too deep into games. No, I'm not encoraging the cheap shots extend to John Maine, just pointing out that what Perez needs now is rest and the same support his teammates should expect.There is plenty more to worry about. Like, for instance, his replacement in the rotation for now, Jonathon Niese, recalled upon Ollie's assignment to the DL. Still wearing No. 49, Niese gave the Mets a few good outings, and a few not-so-good ones, late last season.It appears Niese will last only until the organization thinks Tim Redding is ready. In case you forgot, Redding was wearing No. 44 when a string of bad starts indicated a ten-cent head injury in St. Lucie this spring. In other news, Casey Fossum refused a demotion to Buffalo and signed instead with the Yankees. Loser. Hopefully this doesn't make the World's Worst Person, but I'm compelled to point out Keith Olbermann's recent whack at obscure Mets history on his new blog isn't entirely accurate. The entry concerns Wilbur Huckle, a Met farmhand of the 1960s perhaps best remembered for having been Tom Seaver's first roommate in the minor leagues. Olbermann reports that Huckle in September of 1963 was called up to the Mets but didn't get into a game, relegating him to a rare group of obscure major leaguers he calls the Bill Sharman Society, comprising (by his count) 51 ballplayers who appeared on major league rosters but never in a major league game. The MBTN Research Team, to whom this news was a surprise, swifttly leapt into action and today can reveal the actual truth: Although Wilbur Huckle indeed spent time with the team in September of 1963 he was not officially added to the roster and as a result could not have appeared in a Major League game. As illustrated in the transaction record on the left, direct from the Hall of Fame and the outstanding collection of Met Roster Maven "Jason from New Jersey," Huckle, who was signed as a free agent in May of 1963 and assigned to Class A Raleigh, would not be added to the 40-man roster until October 15 of that year. 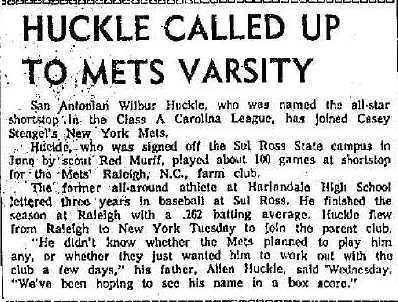 (Looking further into his career, you'll see Huckle was recalled the following September from Williamsport but did not report to the Mets -- a situation similar to that which we examined about Met farmhand Steve Simpson recently. 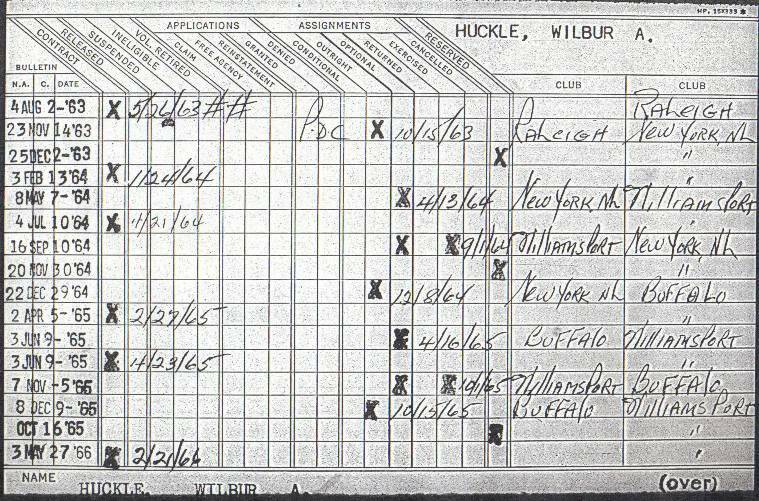 Finally in December of 1964, Huckle is outrighted to Buffalo and off the 40-man roster forever). 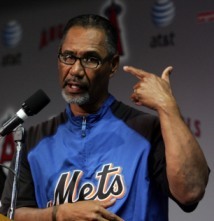 So what was Huckle doing with the Mets then? It appears they simply invited him to New York that month to work out with the team, a practice we still see sometimes when minor league coaches like Luis Natera are brought up, issued uniforms and populate the bench. The below article also provides some explanation, though its obvious that the neither the writer, nor Wilbur Huckle's father, understand that a guy's contract must be purchased before he can play with the big club. So Huckle, by MBTN rules, was never an official occupier of a big-league number on the Mets (though I'd be interested just the same in seeing the roster Keith Olbermann's friend says he appears on). I would also think Huckle would not qualify as a citizen of the Sharman Society although that's Keith's Dumb Obsession, not mine. That group should include two Mets: reserve catcher Billy Cotton (1972) and minor-league slugger Terrel Hansen (1992). Being a positive guy who desperately wants to like the team he roots for I'm hoping there's some hidden benefit at work amid the recent managerial misadventures of Jerry Manuel. But they cannot be worth the the price in bad baseball we've witnessed this week. For the second time in as many series against the Marlins, Jerry overmanuevered the Mets into losing two of three winnable games. He pulled his starters too early, inserted relievers unnecessarily and/or curiously, and this afternoon, publically flipped off Ramon Castro and called it a pinch-hitting decision. None of it worked, and the team, once again, seems to be taking on the passive and frightened style of its manager. I admire Jerry and came into the year convinced he possessed a good understanding of what troubled this team and how to fix it but it seems he's determined to demonstrate that the hard way. I can't imagine Castro sees much more time with the Mets, and wonder what it might take to get Ken Takahashi to show that No. 36 he got the other day. Yeah, David Wright could make it all go away with a few well-timed hits but he's struggled before too. Onto Philly.